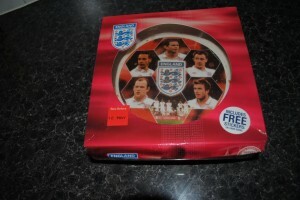 The cake comes in a cardboard box, with plastic see through window and is availble in Tesco and Morrions. The cake is made by Elisabeth the Chef. 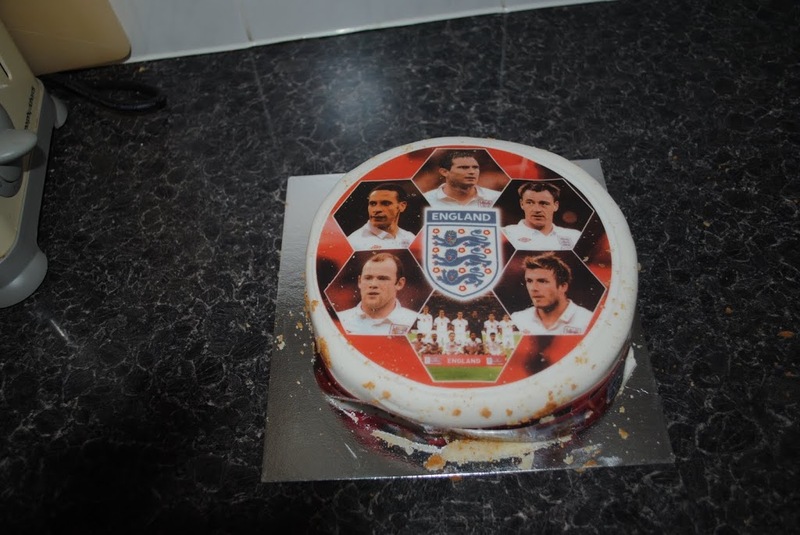 The icing on the cake is decorated with Steven Gerrard, Rio Ferdinand, Wayne Rooney, Peter Crouch, Frank Lampard and Fabio Capello, who are all edible. The cake comes on a silver cake baseboard, which was ideal for cutting and serving. 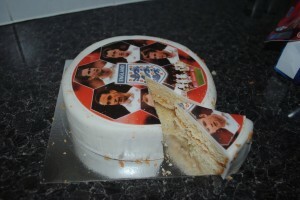 The ribbon around the cake, came off easily and contained football related stickers which the kids loved. Cutting through the cake was effortless, I had to cut through Wayne, sorry England Fans. The sponge part of the cake, is very nice and light, a very nice taste, and the jam, cream and icing complement each other in perfect harmony. 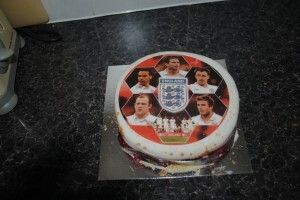 Overall the cake was very pleasing to the eye as well as the taste buds. As an extra treat, there is the opportunity for football fans to win an England bedroom makeover or an England watch by simply buying the special promotional packs and entering the prize draw.